Product prices and availability are accurate as of 2019-04-10 17:49:24 EDT and are subject to change. Any price and availability information displayed on http://www.amazon.com/ at the time of purchase will apply to the purchase of this product. Tender perennial. Also called sweet marjoram, flavor is considered milder but more complex than its relative, oregano. Some describe the flavor as having a hint of balsam. 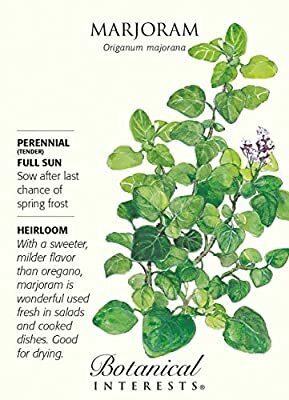 Try substituting versatile marjoram for oregano in many popular dishes such as eggplant Parmesan or pizza! You may be pleasantly surprised! Very popular ingredient in German sausage and herb breads. Legend has it that if you touch marjoram before bedtime, you will dream of your future spouse!